Originally from Italy, Stefania became an artist when as a little child her mum would bring her to the beach and together they would build amazing sand castles. 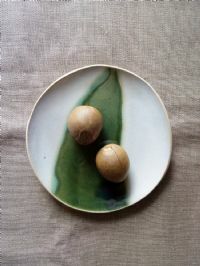 Nowadays she uses different types of clay to create functional minimal tableware. She's in love with every material, every surface and every texture. She loves to imagine that every piece holds something of herself, and that if you own one of her creations her positive vibes will transfer onto you.